This vet guide is to give you some tips on choosing a vet, vaccinations, reducing the risk of health issues, spaying /neutering and micro chipping your dachshund. Many veterinary practices are not able to offer 24hr emergency care, find out where you nearest emergency center is and be familiar with getting there. Start your dachshund care as you mean to go on, when you first get your puppy, have him checked by your vet, and any vaccinations required given. One recommended to you is preferable. Choose a vet that you like and trust. You don’t particularly want the cheapest or the nearest. Ask you friends or the breeder. Ask some questions – what do they like about him/her. You are looking for a vet that gives good service, takes a genuine interest in your dachshund, and is only too happy to offer advice. When your Dachshund is due for his annual shots and heart worm test it is a good idea to have a complete check-up including nail trim and teeth scrape. Make your vets or vet technician job easier by ensuring your dachshund is stranger friendly as possible, often going to the vet center makes your dog anxious. To help with anxiety many dog owners have had success using PetAlive PetCalm Formula. Socialize your dachshund well with a variety of people so they accept strangers. Groom your dog up on a table sometimes, so this is a familiar position. Regularly check your dachshund all over in him ears and mouth, feel him all over handle his legs and feet it is a good idea to name the body part as you check it, by then repeating this at the vets it is a familiar experience. This also allows you to detect any rashes, infections, parasites, lumps or problem areas early. 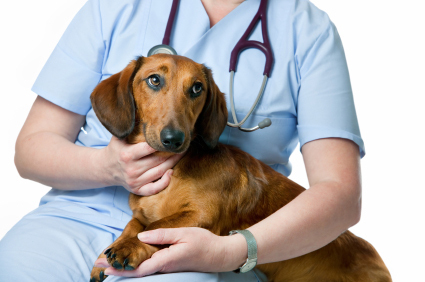 Your vet is the medical practitioner for your dachshund, similar to your own doctor so you want to feel happy to ask any questions and trust his opinion on your dog’s health. The dachshund breed has some known health issues these include, obesity, luxating patella, hip dysplasia and Intervertebral disk disease. Ensure your dog is breed from parents free of the disorders. Do not allow your dachshund to get over weight. Try to avoid encouraging your dachshund to jump into cars, down stairs or on to furniture. Always feed a natural healthy food. Ensure your dog gets plenty of exercise. Supplements such as glucosamine and chondroitin seemed to be helpful. Vaccinations are an important part of your dachshund care, ensuring your dog’s vaccinations are up to date and annual boosters received. Vaccinations usually start at 6-8 weeks your need to consult your vet and insure up to date records are kept. Some of the diseases covered by vaccinations - canine distemper, kennel cough, lyme disease, hepatitis, rabies, measles and parvovirus. The vaccinations required for your dachshund may depend on where you live and the dachshund’s lifestyle. Vet guide advices that you need to be aware it is your responsibility to organize spaying and neutering of puppies, generally around 6 months of age, males can be done a bit earlier but females can only be done around 6 months and ideally before her first cycle as the more cycles they have the higher the risk of mammary tumors. Make sure you know what is involved before you commitment to breeding with your Dachshund. Some health advantages to spaying/neutering – decreased incidence of mammary tumors, prostate cancer, prevents males roaming and curbs territorial behavior also can make a calmer personality. Spaying/neutering does not change the nature or character of your dog. More dog owners and breeders are taking advantage, of the new microchip technology for dogs. The microchip is a small device about the size of a grain of rice and is usually inserted into the area of the dog’s shoulder blades. This microchip contains a number which is revealed when scanned, the chip number is registered with the dogs details and must appear on all veterinary and vaccination certificates. If the dog is traveling internationally you must ensure that you have the correct type of microchip. Every owner of a dog 3 months of age or older, shall require registration and licensing in accordance with local bylaws for the area you reside in. There is a fee to pay and a dog tag is issued, this is usually an annual fee. Owners name and contact details are required. Your dog’s details are recorded. 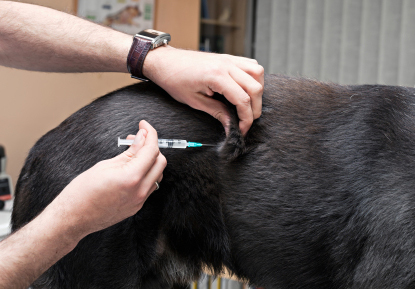 Often a valid rabies certificate is required to prove vaccination is current. Other health certifications may be required depending on where you reside. The aim of this new owner vet guide is to give you helpful information and advice to get you started, with your new little friend.